I know, I know. Why is this recipe being put on the Internet again? Hear me out. I love looking at different versions of our grandmother's recipes because it helps me make my own recipes and it allows me to say my favorite words, "Yes, this recipe is mine." Although I cannot technically claim this recipe, I have tweaked it to make it gluten free for my boyfriend who has Celiac Disease. I used to think quick oats were GF, but turns out, they can be trouble for our friends with this allergy. So I have simply substituted quick oats for gluten free oats, which can be found in the gluten free sections of grocery stores. *Note: The GF oats at your local store may have to be baked before adding to the cookies. Melt your butter. In the pot of course. I refuse to let you guys microwave this stuff. Add the sugar, cocoa, and milk, then bring to a rapid boil. THIS IS SO IMPORTANT! Let it boil for 1 minute and 30 seconds. Add peanut butter, let that melt. Add vanilla and oats, then quickly mix. Pour yourself a huge glass of milk. Go to the gym twice that day. Seriously. I've had so much fun with this recipe because I don't have to measure everything perfect. So if you're coming to the end of this entry and asking why you wasted time on a recipe you already knew, take away that not all oats are GF. Let's keep our friends with Celiac tummy ache free! If you want to add more love to your no bake cookies, checkout our post on how to make them heart shaped. 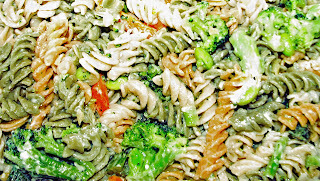 *This recipe was featured at Creative Green Living - Thanks Carissa! Organization & Me? Well, we tend to have a love/hate relationship. I hate getting started, but I LOVE the process and the result. So when the opportunity to co-host Clear Your Clutter presented itself, I couldn't resist. It was the perfect way to get me moving in the right direction, and, just as I suspected, I had a GREAT time. It also got me thinking about how I could improve other rooms. If you are like me and need a little motivation, be sure to link up your organizational projects at the bottom of this post. 2. Use a Lazy Susan. Everyday products have to be within reach. In order to make them less intrusive and more accessible, I have found that a turntable is the perfect tool to cluster my products without them knocking over every time I reach for the ones in the back. Why should Susan only be lazy in the kitchen when the bathroom is where she really needs to save time? 3. Use Any Extra Towel Racks as Necklace Holders. Necklace trees can accessorize your room with style if you have plenty of space for decorative pieces. Because my bathroom has limited counter space, I had to find another option. I use my extra towel racks to display my everyday necklaces. Before implementing the towel racks, I would take my necklaces off and place them wherever I could find a spot, which left my bathroom looking terrible. Now I know right where they go, and it's so easy to put them right back where they belong. 4. Don't waste the tops of drawers. Use drawer shelves. A good way to utilize the often wasted space at the top of a drawer is to insert a shallow shelf that sits on top of the drawer. I happened to purchase this one at Bed, Bath & Beyond, but they are available at most any store that carries organizing products. 5. Make guests' needs readily available in the guest bathroom. I love having guests come to our house. It's fun to find ways to make their space & visit special. One thing I always do is use a basket full of towels, washcloths, toothpaste, new toothbrush & all those hotel toiletries as an accessory for the guest bath. Not only is it a great way to store the hotel toiletries, but it's an easy way to make sure your guests have everything they need. 6. Have a place for everything. Knowing where to put things as you use them is very important in KEEPING your bathroom organized. Here are a few genius ideas that I found on Pinterest and pinned to our Clear Your Clutter board, which is a great place to see more inspiration for organizing all of your rooms (don't forget to follow me while you're there). 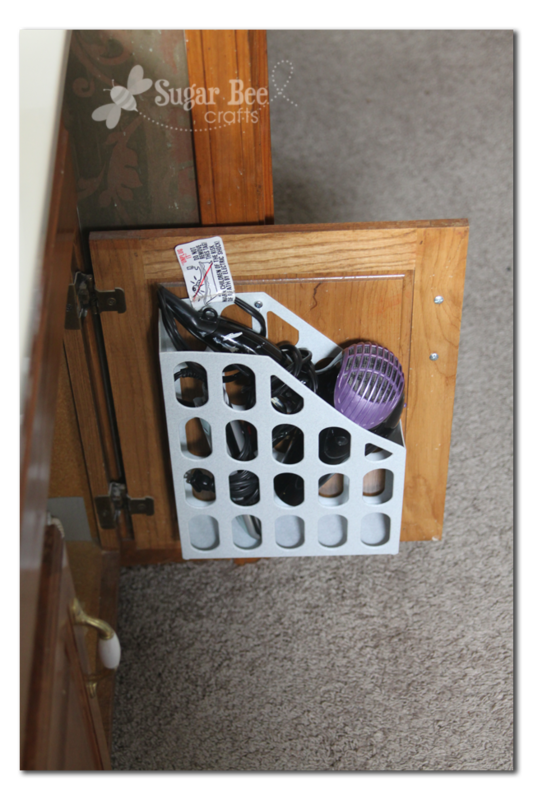 Sugar Bee Crafts attached a magazine file to the back of her cabinet to store her hair dryer. What a great way to utilize space that often is wasted! LTD Commodities sells this towel rack which they say holds 12 or more towels. It would be perfect for my bathroom because I have one little sliver of wall between my door and shower. 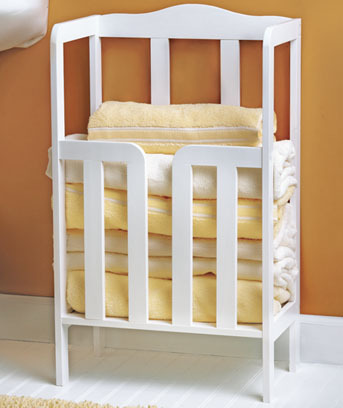 This towel rack looks like a great DIY project. You might even be able to find an old magazine rack that would do the trick. Babble pointed me to a beautifully organized bathroom cabinet from Better Homes & Gardens. I love how they created shelves on the inside of the cabinet and shelf dividers too! The Family Handyman used PVC Pipe to hold curling irons into place inside the cabinet doors. Add your link below and make sure to grab our button and display it either within your post or on your sidebar. Welcome!! I am so glad you stopped by to see our first post. 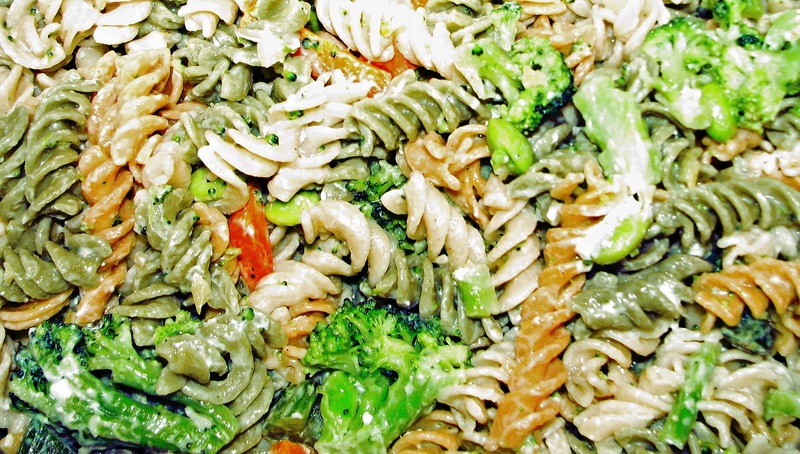 Gluten-free Vegetable Pasta is the Homemadeville Bistro's feature of the day. Although this version is gluten-free, feel free to use regular pasta if you prefer. 1. Boil pasta as directed. I used Gluten-free, so it took about 15 minutes. 2. Melt butter in small saucepan on Medium. 4. Once butter is melted, add garlic. Reduce heat to Medium Low. Remove from heat once it begins to brown. Garlic & Butter - Yummy! 5. Steam veggies in microwave as directed on package - mine took about 5 minutes. Love Easy Steamy Veggies, especially with Edamame! 6. Once pasta is cooked al dente, reserve 1/2 cup of pasta water then strain. Return to pot (or serving bowl). Add butter and garlic mixture and handful of Pecorino Romano. Add in small amounts of pasta water as needed to melt the cheese. You shouldn't need much. Pecorino Romano & Pasta Water Sauce I learned from Giada. 7. Add vegetables and toss. 8. Add goat cheese (more or less if desired). Goat Cheese - My favorite! 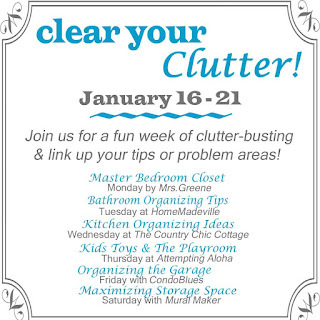 Monday is when the "Clear Your Clutter" Challenge & Linky Party begin! 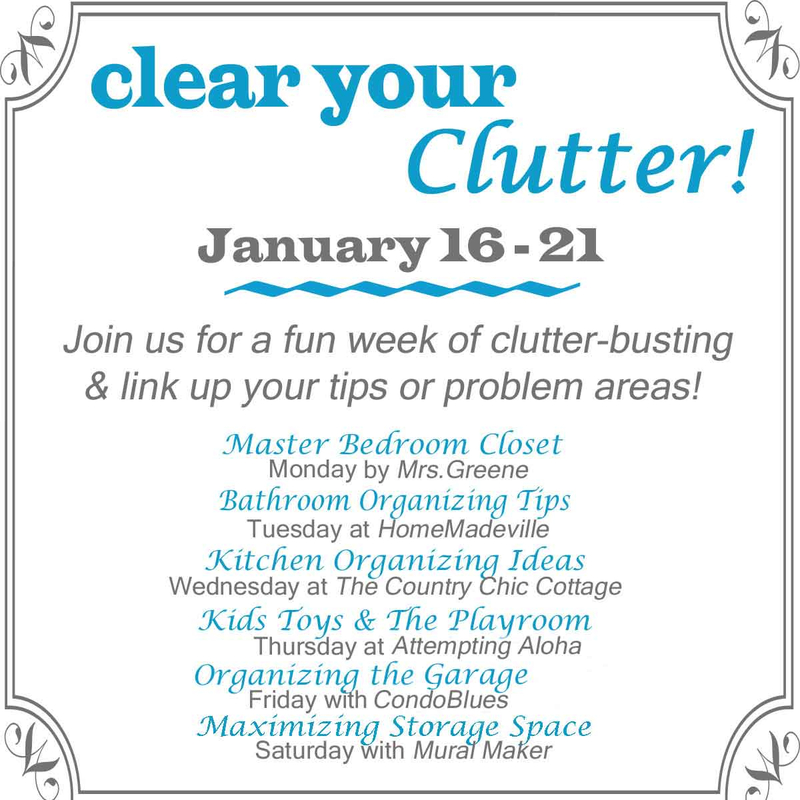 You won't want to miss the organization inspiration from Mrs. Greene on Monday, HomeMadeville on Tuesday, Country Chic Cottage on Wednesday, Attempting Aloha on Thursday, Condo Blues on Friday, and Mural Maker on Saturday. Get your organizational project ready so you can link up with us!